Another winner, I'd say, from Roya – one of Scotland's bright young stars. The choice of material on this exciting CD is wide, varied and carried out with excellent musical precision. From the flying fingers of the modern traditional reels, jigs and comtemporary Orange Blossom Special, to the haunting Highland airs Roya delivers them with a confidence that belies her years. A strong Gaelic influence is obvious in many of the tracks and waltzes in particular are played with a feeling of appreciation of the great music in these songs... yes the time spent studying Gaelic was worthwhile. The inclusion of 'pals' playing the other instruments as well as Roya's own contribution on piano for a track adds greatly to the variety and overall appeal of the music. 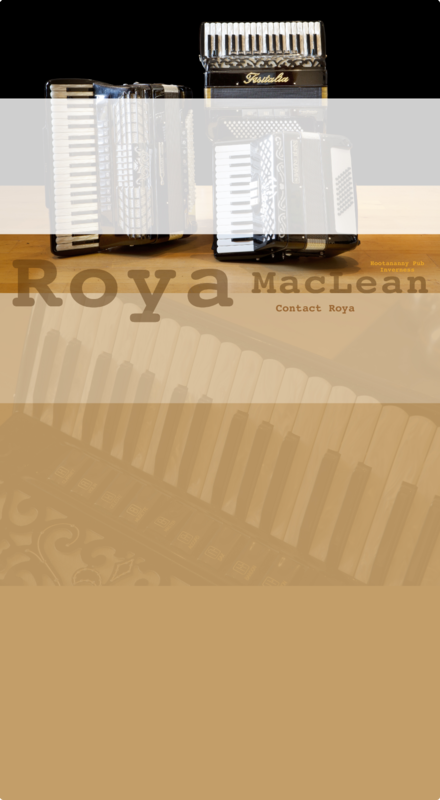 I first met Roya 9 years ago, when she was just starting to learn the accordion. Over the years, I’ve been delighted to see and hear the impressive progress she has made. Already, Roya has a remarkable list of credits to her name. She has won many junior championship titles, in accordion competitions across Scotland and was a nominee for the 2005 National Association of Accordion and Fiddle Clubs “Guest Artiste of the Year” award. It gives me great pleasure to introduce this first recording which showcases her exceptional talent and versatility. Her natural musical ability and style are evident and form the basis of the exemplary standard of playing throughout this album. Roya has chosen an excellent selection of material for this recording and the mix of traditional Scottish and Classical tracks demonstrates that she is equally accomplished in both of these styles. Given that Roya has provided all keyboard accompaniment and that she was just 16, I’m sure you will agree, this album is quite simply outstanding.